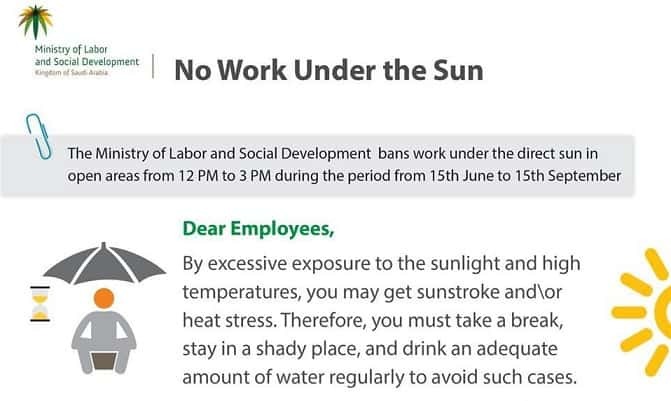 - The Ministry of Labor and Social Development in Saudi Arabia is eager to ensure the safety and health of the workers working in the private sector and its commitment is to provide a safe and healthy work environment for workers. - This resolution is not applicable in some parts of the Kingdom, where the temperatures are low, However their would be coordination of weather check from the governorates of different regions. - In order to receive inquiries and complaints concerning violations of the resolution, all are welcome to communicate through free customer care service 19911.